Open simpleHomeSwitch.html (included in download) and click the sHS commands list button. All the function 1 commands create a new record with default values (simpleDB.ino->void newRecord()). A new record is added or, if the key already exists, just overwritten (no warning!). All the function 2 commands (over)write only the respective default values. Example set on Node03 a record key to switch pin D3 every day: 080:00 ON and 20:30 OFF. Example set on NodeWS a record key to switch OLD KaKu (CoCo) every day on sunRISE or sunSET. Example set on Node04 a record key to switch a boiler on time and temperature. Example set on Node00 a record key to switch a sun screen on room temperature and luminance with button bridge optocouplers. 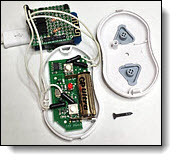 Bridged remote control buttons from Wireless Tubular Sun Screen Motor.